* Runners – send links to your race reports (or in MS Word) to peedeepost@gmail.com. 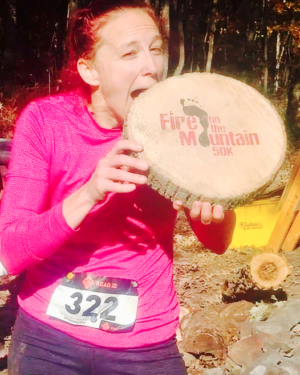 LITTLE ORLEANS, Maryland, Sunday, November 5, 2017 — In 2012, Brad Hinton won what was remains the most closely contested Fire on the Mountain 50K in what was then the brief history of the 32.8-mile trail race in Green Ridge State Forest. Only 42.1 seconds separated the then-36-year-old Virginia Happy Trails Running Club man from second place finisher Adam Hill. 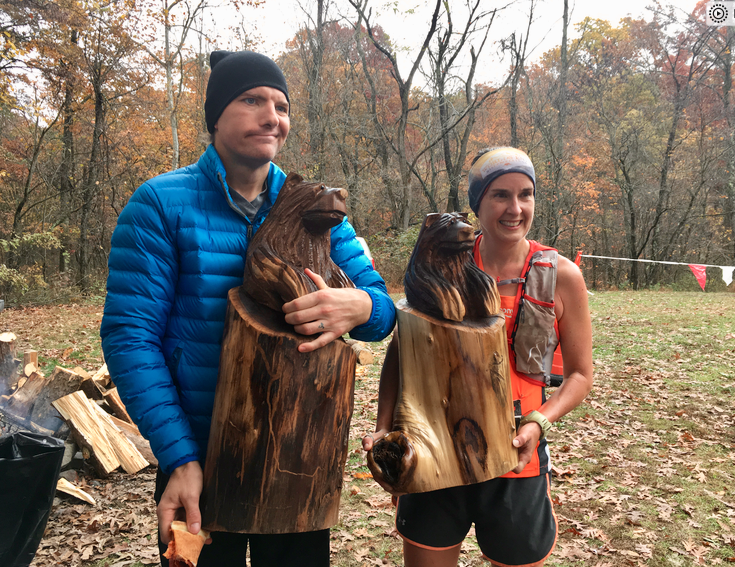 Brad Hinton and Michelle Benshoff pose with their hard-earned bear carvings, presented to the top male and female finisher of the 2017 Fire on the Mountain 50K trail race in Green Ridge State Forest. Five years later, on Sunday, it looked like history was about to repeat itself. Hinton climbed the forest road to Log Roll Overlook and the midway point of the race tied for first among 50K entrants, alongside Alex Krull, 28, of Chambersburg, Pa., both recorded reaching the midway point at 2 hours and 35 minutes. 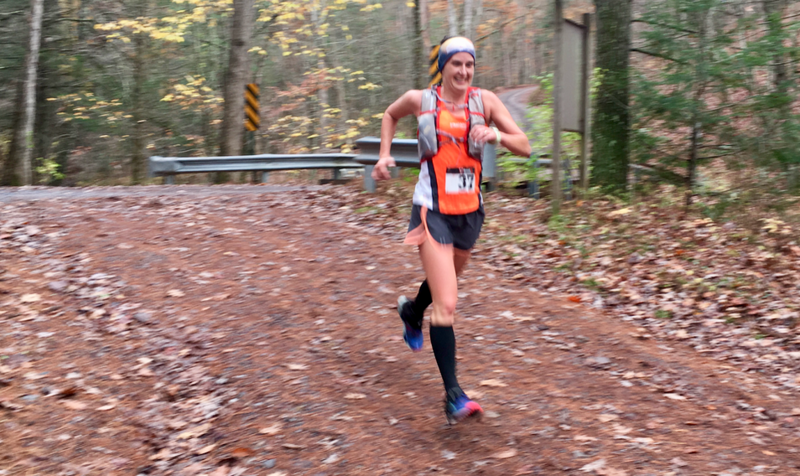 Six other runners were under the three-hour mark — Cheyenne Albert, 28, of Morrisdale, Pa. (first female, 2:49); the 2016 runner-up, Ryan Kidwiler, 23, of Charles Town, Va. (2:49); John Fitzpatrick, 33, of Washington D.C. (2:51); Joel Strouse, 47, of Loganton, Pa. (2:52); Louis Kugel, 40, of Lancaster, Pa. (2:52); and the 2016 overall champ, Michelle Benshoff, 42, of Waynesboro, Pa. (2:53). Relay runner Adam Lowe, 35, of Mechanicsville, Md., was a part of one of three two-person relay teams and led the field to the half way point in 2:33. It was up to Hinton, at that point, to decide how the final 16.4 miles were going to play out. And he didn’t give those close on his heels a chance to weigh in on the matter. Instead, Hinton took control during the second half. 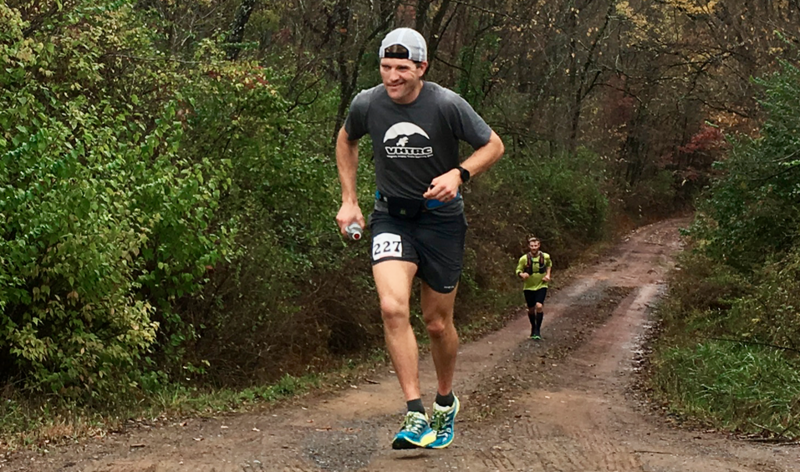 Brad Hinton approaches the midway point of the 7th running of the Fire on the Mountain 50K, ready for another close race -but he put the field behind him in a big way over the second half. By the time Hinton reached the connection point between the Deep Run/Big Run (green) Trail and the Long Pond (red) Trail at Aid Station 6 (Mile 23.9), he was comfortably ahead. At that point, Benshoff was his closest competitor, but the two were 16 minutes apart — a nearly insurmountable lead, even though just about anything could happen along the second effort of the red trail. By Aid Station 7 (Mile 27.2), Hinton appeared to the casual observer to be on cruise control. He was loose and talkative with those at the spot that lay less than 10K from the finish line. His lead over Benshoff was now 17 minutes, and Fitzpatrick was 24 minutes off the leading pace. Hinton strolled into the finish line, situated for the second straight year since the course was changed to the out-and-back variety, and stopped the clock in 5 hours, 31 minutes and 55 seconds. It was well off his winning time in 2012 of 4:38:7.1, and Hinton dismissed the idea that the heavy rains that washed over Green Ridge State Forest Saturday night and into race morning had anything to do with it. Instead, he acknowledged the increased difficulty of conquering the red trail a second time, on tired legs, in a direction that offered more and steeper ascents than seemingly anything else. Benshoff, all smiles after passing Cheyenne Albert, her closest female competitor, shortly after Aid Station 5 on the green trail. Here at Aid Station 6, only Brad Hinton was in front. Benshoff, for her part, proved nothing if not consistent. 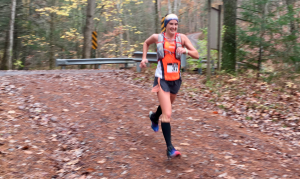 She won outright in 2016 with a time of 5:51:32.5, and followed that up Sunday with a respectable 5:54:06 in less than ideal conditions — additional downed trees, mud and trails covered with acorns, then leaves, and slippery rocks. It was sometime near the midway point that the women’s field leader, Albert, communicated to Benshoff and indicated that her race was not going to be her best effort. “You can catch me,” she reportedly told Benshoff as leg cramps persisted the second half of her race. Benshoff is not one who needs a whole lot of external motivation, but when it’s freely given, she is a willing recipient. Last year, Benshoff’s winning time was the fifth fastest time by a female in FOTM history. This year’s time takes over the No. 7 spot, and she is now the only runner, male or female, to have two performances on the list of Top 10 50K all-time performances list. Albert, third among 50K runners at the midway point, remained competitive with the help of friend and running partner Strouse, finished in 6:16:12 to take home a wooden spoon with the FOTM emblem on it that was handcrafted by Pete Hobbie Woodworks. The bears were carved by Bob Wilt, of Garrett County, Maryland. The 2017 version of the event, and second on the out-and-back course, featured for the first time a returning champion — and there were two of them, and both proved that the first go-round was anything but a fluke. Lowe, in the relay, teamed up with Robert “Moe” Morris, 65, of Clear Spring, Md., to win the relay title. Their mark of 6:03:28 was good for fifth on the all-time relay performance list, with splits of 2:33 for Lowe and 3:30:28 for Morris. But that wasn’t the only team to make its way into the record books. Misha Kelbatyrov, and Janelle Weaver, both 36, and both from Lewisburg, Pa., combined to finish in 6:56:34, good for 10th on the all-time list. Kelbatyrov ran an impressed 3:38 first half while Weaver conquered the red trail in style, marking a 3:18:34 second half.